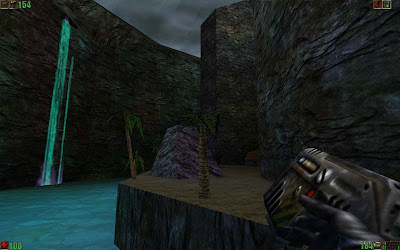 Unreal (1998) was Epic Games' first FPS. Compared to their blockbuster Gears of War franchise now, Unreal was rough, unfocused, and ponderously long; but it was also immersive, fun, inventive and visually stunning. A proud moment for a company that has come a very long way in the eleven (!) years since. Players will likely remember a key handful of scenes: the prison ship introductory level that opened up into an impressive waterfall reveal, the first Skaarj fight as the lights turn off, the four-armed Nali and their healing fruit, the "Big Man," and the Sunspire (if they got that far). Start with the same premise and extrapolate from what you remember best and fondest, not what was. Stir in exploration elements and some Metroidvania while you're at it. Put it all together with the rigor of modern design methodologies--but stay with the neophytic verve that informed the original. Invasive Species starts again with you as a prisoner on a prison ship. Expand the vestigial kernel presented at the beginning of Unreal (a choice of male or female character model/sound set) into a full blow character selection. Multiple options for character appearance, and more critically, a selection between archetypal backgrounds which dictate starting abilities and conversation options. The prisoner emerges from the prison ship wreckage to find a breathtaking alien world: exotic and fecund, though the flora seems close to a Earth-tropics analog. The player's objective is simple: escape the planet and evade re-capture, should anyone come looking. What the player gets is a planet-wide Battle Royal, with all manner of jockeying for position and shifting alliances, and a running day/night system by which new developments are doled out--say between day 7 and 10, the pursuit vessel crashes. Around day 15 the deathgrass spreads enough to become self-aware, and so on. Check back tomorrow for the Metacritic score, more illustrations, and a breakdown of the various factions/wildcards of the game world and plot outline. In the meantime, anyone have a better (and hopefully pun-less) title for this one? 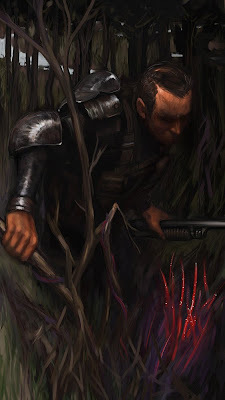 Edit: name changed from "Lost In Space Marine" to "Invasive Species" courtesy of Design Reboot regular Johnnyburn. 2) whose introduction causes or is likely to cause economic or environmental harm or harm to human health." Hahaha... I will defend hivemind deathgrass on the bounds that it's not really the primary focus of the game, just a small element that begins to snarl things more the longer the game runs. And everything seems like a bad idea if it's something used in latter day Shyamalan--alien invasions are 100% legit awesome, but a little girl and glass of water can suddenly make them seem lame. My counterexample would be the vine plant in The Ruins (the book, not the apparently terrible film). It's an amazing monster because it's subtle and inexorable, elements that I like. The deathgrass would be like a slow motion time bomb on the planet. Invasive Species, the more I think about the more I like it. It works for the killer grass but it also works for the various aliens (including the humans) that come to the planet and generally muck things up. I was kicking around ideas for this post with Aubrey and he pointed out he had read how Americans have more prisoners per capita than anyone else in the world... the idea of privately held post space-colonial prison systems and the prisoners trafficked in them seems ripe for exploration. Plus some light considerations of the more obvious environmentalist themes, but talk about themes that need a light touch. Avatar already seems to have the market cornered on boring space marines come to alien world/FernGully remakes for now. This game sounds sweet. The multiple threats is something I would like to see more in games-- being tracked from behind vs. the threats faced with progressing could be pretty interesting. Unreal was also often cheap, setting traps for players that could only be avoided after getting killed once... I was thinking of trying it again after reading this until I remembered why I didn't beat it on the first attempt. The death grass reminds me of Bio-Wire from Rouge Trooper (2000AD), the razor wire would come alive and entangle people and feed on their juices! I like the idea of the Death Grass spreading, it could also be a type of time limit for the game. The name 'Invasive Species' is awesome!! It's short and clearly gives an idea of what the games is about, much better than a name such as 'Halo: Combat Evolved'. Thanks Chris! Yeah, credit John for that name. I think when you're hunting for a name you can forget what's right there in front of you, which is where this name was. And yeah, the way the write-up came together I was interested in the idea of just a lot of interesting inter-relations between NPCs that do something other than, you know. Stand around waiting for the player to show up to kill/assign a fetch quest. John deserves a medal! Outstanding! Talking names I've just posted a link to a great article by Scott Millar on how to name games. "Unreal was also often cheap, setting traps for players that could only be avoided after getting killed once... I was thinking of trying it again after reading this until I remembered why I didn't beat it on the first attempt." What? There are about three deathtraps in the entire game, that are all easy to evade, and almost every enemy has some (in most cases, multiple) way to avoid their attacks or counter them. The fairness towards the player is one reason Unreal is one of my favourite FPS games. I'm not sure this is the direction I'd want a real Unreal sequel to go; I'd rather it have at least some narrative drive rather than being almost completely sandbox. On the other hand I'd consider by far the most important thing for a sequel to have is fully realised and fantastical environments that are almost completely explorable, like most of Unreal's best levels are-Bluff Eversmoking being the zenith-and it definitely sounds like its got that part covered (especially as STALKER and Metroidvania are cited as a big inspiration). Thanks Chris. I remember seeing that article. I try to keep the marketing machinations of "branding" and other such slickness out of the considerations when building these ideas--they're purely hypothetical after all, why curb them? On the other hand, often what ends up being good branding etc. also falls in line with what's a good idea generally. Mman: I apologize for some of these ideas being a bit of a trojan horse--I'll start with a familiar title as a recognizable point of departure, but by the time I'm finished with the writeup, it might be reboot-worthy or really a different idea entirely. Invasive Species is clearly the latter, which surprised me as well once I finished writing about it. Anyone else think Invasion Species has a slightly better ring with roughly the same meaning? Reboot Reboot: 1-800 HOW'S MY BLOGGING?